'In the Heights' at Sydney Opera House. Photo by Clare Hawley. 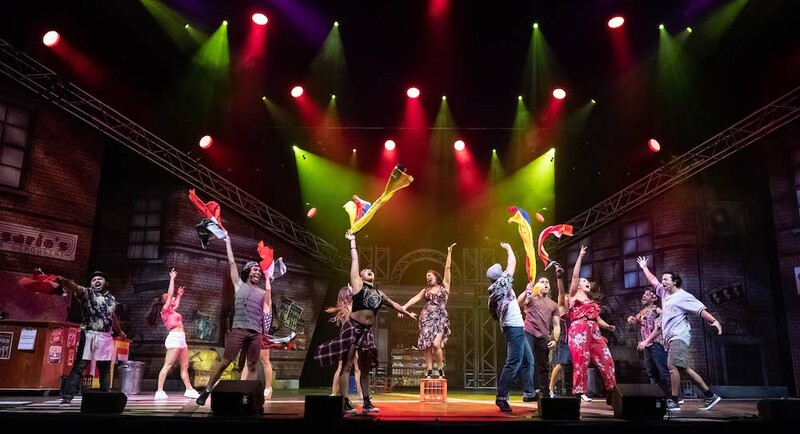 Lin-Manuel Miranda’s Tony Award-winning musical, In the Heights, once again takes to the stage in Sydney. After a smashing season at the Hayes Theatre in 2018, the show returns, with some original cast and crew, for a short season as a part of Sydney Festival 2019, and the Sydney Opera House (SOH) Contemporary Performance Program, led by Olivia Ansell. 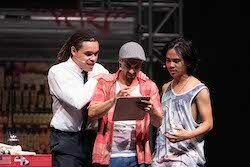 Joe Kalou, Stephen Lopez and Marty Alix in ‘In the Heights’ at Sydney Opera House. Photo by Clare Hawley. Explosive and exciting from the beginning, In the Heights is everything you want in a musical and more. Making its debut in 2008, In the Heights has been dubbed the revolutionary show that changed Broadway. Miranda created a show that includes strong lyrics, with punchy music that doesn’t ring of the musical norm, and snappy dance routines that combine salsa and various styles of hip hop, with rap woven cleverly throughout, driving the show at a pace that keeps the audience captivated throughout. 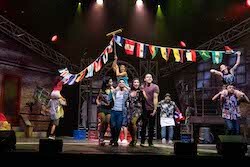 In the Heights explores the life of vibrant, close-knit, low socioeconomic Hispanic community in Washington Heights, that are struggling to cope with the changes of the fast-paced city and times, a juxtaposition of a culture trying to keep its unique identity, and the metropolitan melting pot. Individual stories weave together to culminate in emphasizing that community is the thing that matters most. This SOH season, under the direction of Luke Joslin, with music direction by Lucy Birmingham and Choreography by Amy Campbell, is a wonderful celebration of relevance and culture, from start to finish. ‘In the Heights’ at Sydney Opera House. Photo by Clare Hawley. 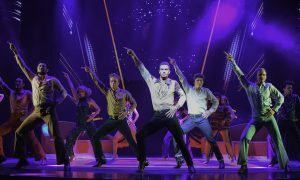 With seamless transitions, exciting and innovative choreography, coupled with authentic performance, the mostly young cast really do hold their own. It was wonderful to see majority authentic ethnicity in the casting, many still fresh to the professional industry, pour out their heart and soul so openly into the work, their enthusiasm bringing a wonderful vibrancy and uncomplicated edge to the performance that had the audience quite enraptured. Industry veterans such as Margi de Ferranti (Abuela Claudia) and Ana Maria (Camilla) brought a balanced maturity and groundedness. Vocally strong, the new talent shone through. Particularly outstanding was the lyrical but effortlessly strong Olivia Vasquez (Vanessa), and the versatility of all, but particularly Stephen Lopez (Usnavy) (and others), who alternated between rapping and singing, whilst holding a lead, as if to drive the momentum in a rich and textured way, exploring his role in a manner that spoke of something awakening, an undercurrent, the struggle between what is, and what could be. 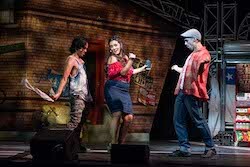 Marty Alix, Olivia Vasquez and Stephen Lopez in ‘In the Heights’ at Sydney Opera House. Photo by Clare Hawley. At times, the lyrics were hard to understand, which can make it difficult to pick up on the scripted nuances for audiences who do not already know the show in detail prior to viewing. Short and punchy tunes and scenes were refreshing, but there seemed to be a lack of character or story development to entirely justify some outcomes and responses. All in all, In the Heights was an enjoyable package of a show that Miranda has tailored to a generation who crave relevance and innovation. 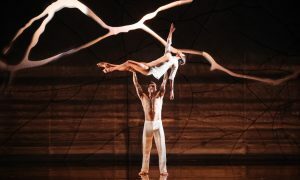 Campbell’s well-crafted choreography leaps to the challenge of versatility, cultural relevance and currency, and Joslin’s direction lends itself towards the same, with wonderful casting to highlight the individual whilst keeping a perfect group cohesion. In the Heights is a wonderful addition to the Contemporary Performance Program at SOH, and we look forward to seeing all the treats that the program has ahead for the 2019 season.